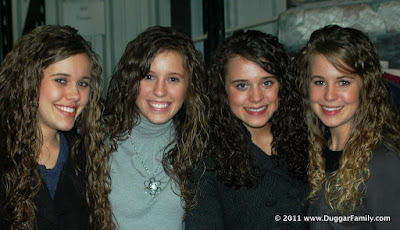 The four oldest Duggar girls range in age from 19 (Jinger) to 23 (Jana). If you had to describe each of them in one word, what would you say? This was hard to limit it to one word. 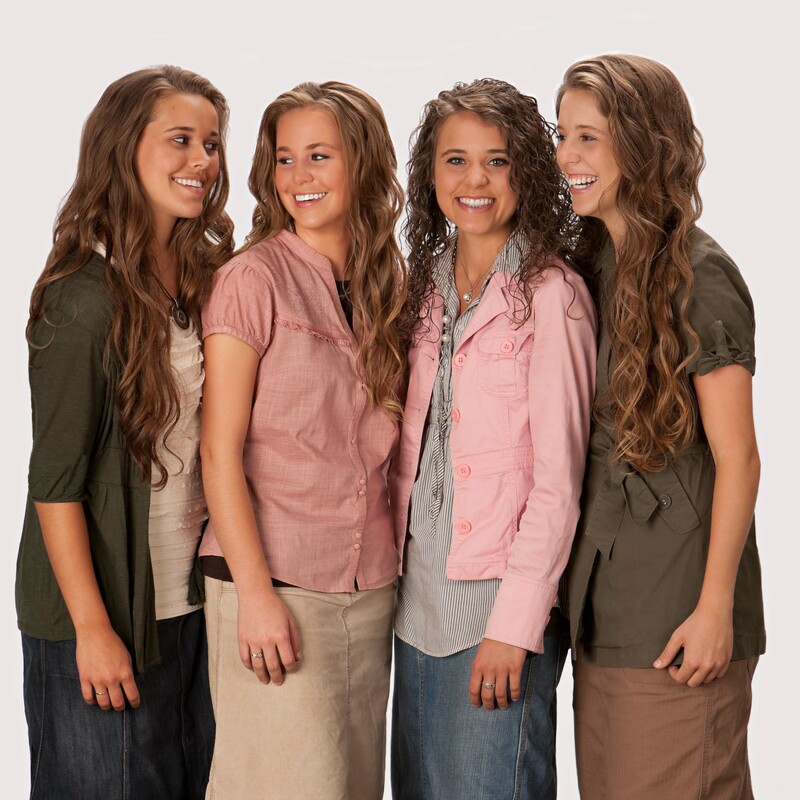 I think each of the Duggar Ladies has all 4 of these character qualities and more! They are such a blessing to others and a wonderful example to other young ladies! The Duggar girls are pretty close to our family and we enjoy hanging out with them! We just spent a lot of time with them at the ATI conference! It was so much fun! 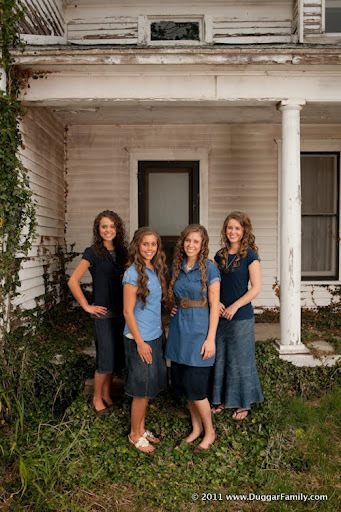 We love the Duggars and have watched all their shows when available to us in Australia. We made a large wall banner with all the character qualities printed on it. We sent it to the Duggars and are hoping they received it. Jinger has the funniest personality of the family. All four of them (and Joy!) are just lovely. They are the kind of role models I want my daughters to look up to! It's so encouraging to see young women make purity and faithfulness look so attractive! They are all very sweet and loving too!! Jana- Leader. She's the oldest girl and just sets the example for everyone else. Jill- Teacher. She seems to love being around and teaching the younger kids. Jessa- Joyful. Jessa seems to always bring happiness where ever she goes. Jinger- Caring. I always see her taking time to help someone else. all four of them very caring and loving And BEAUTIFUL. Am I the only one who thinks Joy-Anna gets the short end of the stick sometimes? She's too young (to some extent) to run around with the four older girls, but much too old to be with her younger sisters. All four are young ladies I look up to!!! and they all are beautiful! All four of them - absolutely beautiful, inside and out. All 4 are just . . . refreshing! Beautiful inside and out - their beauty comes from deep within as they reflect Christ's beauty! JoyAnna is in an in-between age. Still a girl, not yet a young woman. She'll grow soon enough. We all have to. But she isn't nearly as old as the other girls, who are old enough to be out doing things and who are more or less adults. So for now, she isn't ALWAYS included. She'll get her turn soon enough. These 4 young ladies are lovely and compassionate in a Godly way. I hope to someday meet the whole family along with my 3 daughters who I've taught to be like Jesus. All of them are beautiful!! Does anyone else think that Joy should be included as one of the older girls now? I mean she's mature, she's in high school, and she is much to old to be hanging out with the next youngest Duggar girls. I know I would feel really left out. Just my opinion. That was hard! all of them are such sweet godly young ladies! they are such an inspiration! it's hard to think of 1 thing! Jessa- confident, funny, out going and stunning looks just like angelina jolie! All the girls are loving and humble, helpful and caring. They are my role-models. I often wonder how they do it. Good job girls, and don't stop. You were created special by God. It's true. It is hard to pick only one word for each, so I picked two and even that was not easy. I'm not one to post comments on peoples blogs or anything, but I just LOVE the Duggards and follow them as they follow Christ. All the girls are really so godly, beautiful and talented, and I'm so blessed to witness the way they carry themselves- with true beauty as God sees it, and with dignity. May the Lord help them to continue to fulfill His purposes in their generation.